1. Plug in your usb stick. The usb stick MUST contain a bootable operating system. This can be anything that boots from an usb stick. Your output will look different from mine, but you should be able to find the partition(s). In my case it is /dev/sdd1. 4. Now comes the interesting part – creating the vmdk file. 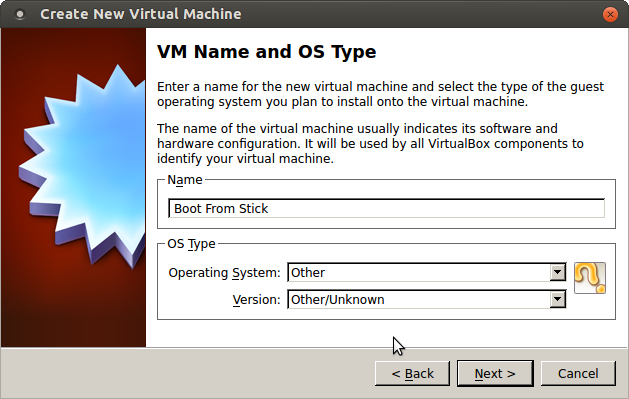 To achive this I’ll use VBoxManage the console interface provided by VirtualBox. The internalcommands providing a command called createdrawvmdk. 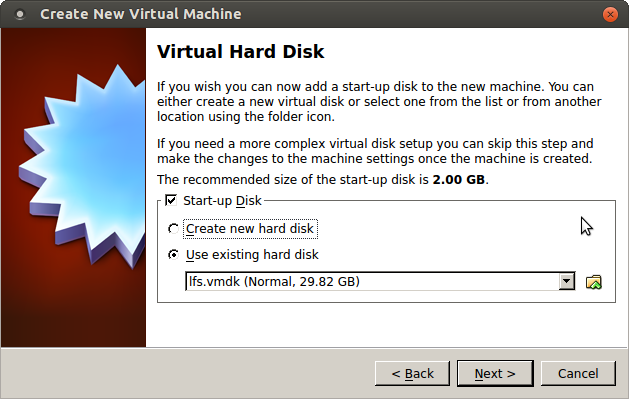 The command creates a .vmdk file using a raw disk from the host system. This file can be used later as a *harddisk* for a virtual machine. Yes!, that’s exactly what I want, the raw host disk in this case should be my usb stick. (!) Note: In this tutorial I’m using the low level (usb)disk device. This is similar to plugin the usb stick into a regular hardware and boot it. So the device of interest is /dev/sdd and not /dev/sdd1. RAW host disk access VMDK file /home/thorsten/Desktop/lfs.vmdk created successfully. 5. 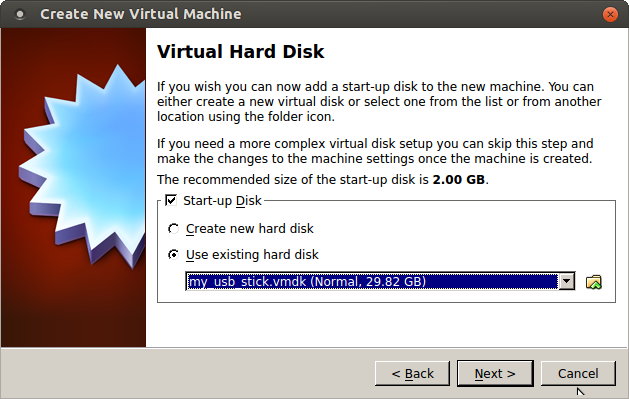 Create a new virtual machine that uses the my_usb_stick.vmdk as harddisk. This can be done on command line too, sure. To not confuse readers I’ll use the more regular graphical interface. 5b. Click the ‚New‘ button. 5b. Click ‚Next‘ and choose a name for the virtual machine. I used ‚Boot From Stick‘, as it can be everything that is installed on stick (and this may change). 5c. Click ‚Next‘ and select the memory size for the virtual machine. I selected 1024MB / 1GB in this example. 5e. Click the folder item next to the list box with images. Then select the vmdk file created before. 5g. Click ‚Create‘ to finish the process. Conclusion: VBoxManage internalcommands createrawvmdk is a nice tool when debugging boot problems or just run your portable usb stick linux in parallel with your home system – maybe be in order to transfer files. In addition createrawvmdk works with regular harddisks or other mediums too. So it might not ever beeing requested to boot from that media but to mount it during runtime – no problem. I hope they will not remove this feature in upcoming versions. When I attempt this I get an INT18 BOOT FAILURE. Has anyone else made this work? Does VBoxManage outputs this in terminal? Which guest OS do you use? Thanks a ton.. for nice article..
Nice piece of work! It looks reasonable to me. which is probably fine as well (?). (2) But when I assign „my_usb_stick.vmdk“ to my VM it complains about not sufficient permissions. „chown“ to myuser:mygroup on my_usb_stick.vmdk does not help. Neither does a „chown“ on /dev/sdg (which is generally a bad thing anyway). I’m using VirtualBox 4.3.8 on a Ubuntu host with an USB-Live-System of SliTaz as guest. Do you have any clue about what is going wrong? … @Gagandeep: OK. It works if you have sudo permissions. But in my opinion it should be possible as „normal“ vboxuser als well. yeah, this are reasonable concerns. I’ll review this. Many thanks for your feedback! This helped a bunch, thanks! What permissions to I need to change in Debian for my sudo user to be able to use the vmdk instead of just root? I had the same problem, and found the solution at ubuntuforums: your user needs to be member of the groups ‚vboxusers‘ and ‚disk‘. My user was a member of ‚vboxusers‘ but not of ‚disk‘. Select your username, click on ‚Advanced Settings‘. Log out, log back in and you should not get the error any longer. I did not want to run Virtualbox as root. I did not want my user to be of the disk group, having full permissions to all disks. In the above you can see that I had to reset the permissions for the memory stick a few times, because it would get set back to root each time.